In little over four years’ time nearly a fifth of Bangladeshi brinjal farmers are now cultivating – Bt brinjal – a GM eggplant, making it one of the fastest adopted biotech crops ever, reports UNB. After October, 2013, regulatory approval, Agriculture Minister Matia Chowdhury handed over Bt brinjal seedlings to 20 selected farmers in four districts on an experimental basis in early 2014. 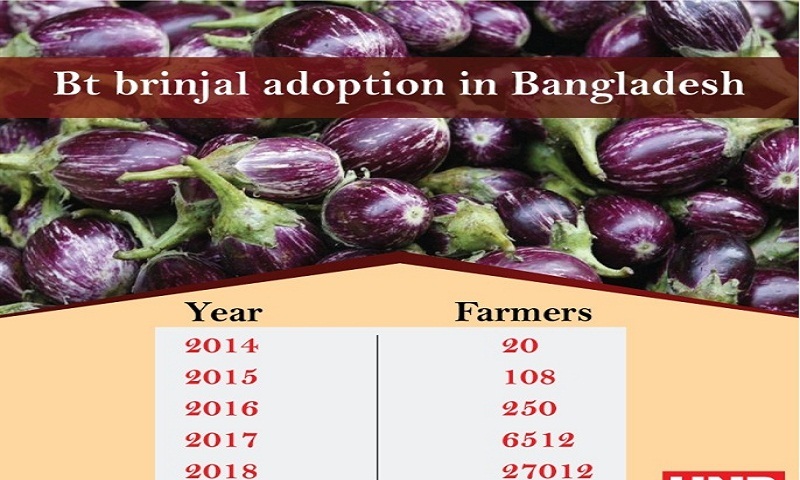 This year the four Bt brinjal varieties reached out to 27,012 farmers across the country, which constitute roughly 18 percent of Bangladesh’s estimated 150,000 brinjal growers. The paper depicted figures that show a substantial increase from the 6,512 farmers who had adopted Bt brinjal in 2016-17. Bt brinjal was first released experimentally to just 20 farmers in 2013-14, 108 farmers in 2014-15 and 250 farmers in 2015-16. Cornell University’s entomology professor, Anthony Shelton; Feed the Future South Asia Eggplant Improvement Partnership’s Bangladesh Country Coordinator, M. J. Hossain; Bangladesh Agricultural Research Institute (Bari) Director General, Abul Kalam Azad; along with several others co-authored the paper on Bt brinjal’s status in Bangladesh. The scientific paper referred to a Bari study conducted in 35 districts during the 2016–17 cropping season using 505 Bt brinjal farmers and 350 non-Bt brinjal farmers. Net returns per hectare were US$ 2,151 per hectare for Bt brinjal as compared to US$ 357 per hectare for non-Bt brinjal, a six-fold difference. This study also indicated that farmers saved 61 percent of the pesticide cost compared to non-Bt brinjal farmers, experienced no losses due to EFSB, and received higher net returns. Bt brinjal, which tastes as good as any conventional aubergine, credited for saving farmers a amount of money otherwise spent on pesticides to fight EFSB (eggplant fruit and shoot borer), the most damaging pest of eggplant in South and Southeast Asia. EFSB ravages brinjal fields and can cause loss of the crop by as much as 70 percent unless a heavy dose of pesticide is used. Bari scientists had successfully engineered local varieties of brinjal, one of the country’s most consumed vegetables, by inserting a crystal protein gene (Cry1Ac) taken from the soil bacterium Bacillus thuringiensis, known as Bt, back in 2005. Bt gene insertion in brinjal made it resistant to EFSB. The India-based Maharashtra Hybrid Seed Company (Mahyco) first developed an eggplant expressing Cry1Ac (EE-1) for control of EFSB. In a partnership among Mahyco, USAID, Sathguru Management Consultants, India, and Cornell University the EE-1 was provided to the Bangladesh Agricultural Research Institute (BARI) who bred it into local varieties. It took seven years to complete greenhouse trials and open-field trials of Bt brinjal in various agro-ecological zones in the country, and upon regulatory approval in 2013, the Bt brinjal seedlings were first released in January 2014. Though brinjal is a staple in vegetarian diets throughout South Asia, and one of the cheapest vegetables to procure by resource-poor communities in Bangladesh, a large percentage of the crop does not make it to the market because of EFSB infestation. In Bangladesh, brinjal acreage is around 50,000 hectares, which is one fourth of the total acreage of all vegetables. Annual brinjal output is estimated at about 3.5 lakh tonnes. After reversal of a 2015 judicial ban on field testing of GM crops, the Philippines is now in the process of releasing Bt brinjal, expectedly some time in 2019.